Lets have a look at how to create the look of the above illustration and animation " Atomic boy". For this tutorial I assume some basic knowledge of Blender and Photoshop. It would be complex to go over every detail so I am going to mostly cover the shading, rendering and how to create the basic buildings. 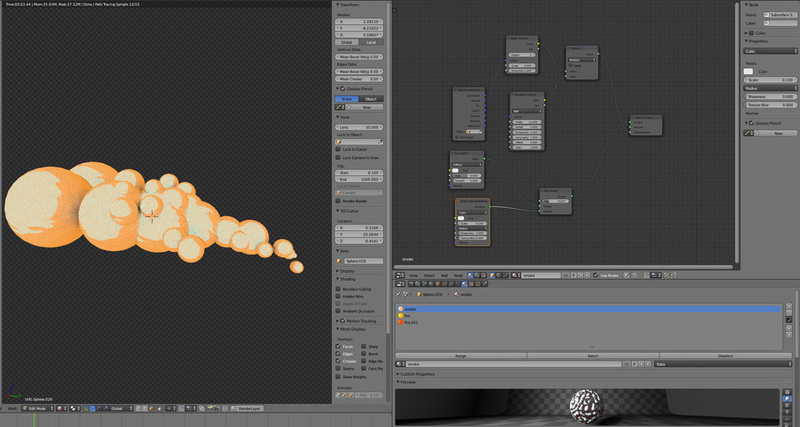 After opening Blender and choosing cycles from the render options, the first thing to set up is the environment and sun. This is fundamental to getting our toon look. What we want is a strong background colour and sun colour. I like these to contrast with each other. Opposite background and lamp colours work well to create interesting light and the coloured shadows that we associate with toon images. I choose a strong orange for the environment set at a strength of 1.2 and a blue for the sun set with a strength of 2. Importantly the sun size is set to 0. This will help create hard toon like shadows. I also add a little ambient occlusion here at 0.09. We can create some basic buildings using the array modifier. Simply create a cube and resize so it is rectangular, sub divide several times. Extrude some basic windows into the building. Then we use an array modifier on our cube. Choose Relative offset in the z direction to build our levels upwards. You can add as much or as little detail as you want. Its gratifying to add extra detail to our "base" object and see it added to all the levels instantly. I also add some extra detail on top of the building I just use add a cube and shape like a vent or water tower and place it on top. Then parent it to the main building. We can then shade our building. I use the Blenders default toon shaders. I create a slightly textured look my mixing two toon shaders with a brick texture. For the windows I use a dark colour toon shader set to glossy, so we have some reflections. We can then duplicate buildings and alter them to our hearts content. Also adjust the colours and textures on various buildings to create more interest. If you duplicate a building you can easy change colours by clicking the little number icon next to the material name. This makes a single user version of the colour. You can then alter the colour without effecting the original. I add some signs and other small details, all using toon shaders for colour. You can use a plane and expand it to create the ground. Colour some darker strips on it by dividing it and selecting loops to create roads and pavements. I add street lights, cars and other smaller details. You might want to add something interesting into your scene like a robot or giant monster. In my illustration I created a robot boy with a force field around him. The robot boy is quite simple, I sub dived cubes to make the head and body . A sphere is cut in half and used for the ears an the arms and legs are simple curves that have been extruded. I also made some toon smoke. This is just made out of a series of spheres, these start small close to the centre of action and get larger further out. For the shading I used a mix of toon and subsurface scattering. I also used some textures into the displacement slot to get a slight roughness. This helps break up the shaded areas to add texture. The smokes is then duplicated and distributed through out the scene. For the bubble I used a glass shader mixed with a transparent shader, I used ray depth from the light path input to mix them, and turn the index of fraction down to 1.150 on the glass. This created some nice distortions in the bubble. Remember to get a nice camera angle also, a slight tilt to your image can add a scene of movement and dynamics. When you have built your city and are happy with it its now time to render. We actually dont want the sky to render so we select transparent in the Film settings. We are going to use a default render and one with a mist pass. The mist pass is found in the scene settings panel. An important thing to check when you deliver a mist pass is that the depth settings are correct for the scale of your scene, a large scene will require a larger depth on your mist settings. This setting is found under the world property panel. We can save our renders and open them in Photoshop. You should now have a default render and a mist pass of your image. We ill use our default image to build or image and keep the mist pass for later. First thing I do in Photoshop is add a back ground colour to a new separate layer, this will be my sky, I also add a gradient fill and back sure its a the back of my layer stack. I then duplicate my default render and change the saturation value of the image render, I make it a bit redder to add contrast. Next I duplicate that layer and select Filter > Stylise > find edges. I then blend this with a screen blend. We now have some toon edges ready for our image. I duplicate this layer again and colourise it so it is dark blue. This time I create a layer mask ans paste in my mist pass. If you don't know how to do this my tutorial Making your render more vibrant under the heading HOW TO USE AN IMAGE AS LAYER MASK IN PHOTOSHOP. I give this layer an opacity of 92%. Our image is now coming together. Next I add a copy of the mist pass directly into the layers of our file. I colour this blue and use an overlay blend at 62%. I add another layer on top with a red fill and use the mist pass again but as a layer mask. You can do this easily but selecting alt and dragging our already made mask into the layer we need it. This creates a duplicate. I duplicate my base layer again to add some more contrast, setting this to colour burn at 18%. This is all used to create some atmospheric depth to the image. Finally Adjustment layers to tweak the levels and a slight photo filter. On top of that I add a dirt texture I made myself. I set this to multiply at 100%. Though I haven't gone over every detail I hope you find this useful in some way and discover interesting ways to comp you images. Also not because the blend setting are similar across much of Adobe software we can use very similar but simpler settings in After Effects, which meant I was able to animate this illustration and create the same look in the animation.